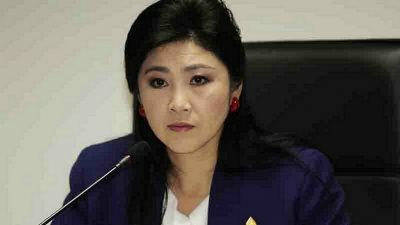 Shortly before ousted Thai prime minister Yingluck Shinawatra was to face a court ruling for her failed populist rice subsidy scheme, she reportedly fled the country, joining her likewise fugitive brother Thaksin Shinawatra in hiding abroad. Thaksin Shinawatra was himself ousted from power in 2006 for similar charges of corruption and abuse of power. While the US and European media attempt to frame the Shinawatras as victims of powerful, democracy-adverse institutions in Thailand, sensible analysis must consider the fact that Thailand does not exist in a geopolitical or socioeconomic vacuum. Much larger forces are at play beyond Thailand’s borders, and the role the Shinawatras play on behalf of some of these forces helps reveal the truth behind their ousting from power, their fleeing abroad and all of the support they continue to enjoy across the US and European media. Yingluck Shinawatra took office in 2011. Despite being depicted by the US and European media as a “landslide victory,” her brother’s political party, Pheu Thai, won elections with only 35% of all eligible voters’ support, failing to garner even a popular majority among those who participated at the polls. The party campaigned openly portraying Thaksin Shinawatra, a convicted criminal and fugitive residing abroad, as remotely running the party with his sister serving merely as a proxy. The campaign slogan even boasted, “Thaksin Thinks, Pheu Thai Does,” openly flaunting the legal and political impunity the billionaire still enjoyed in Thailand. One of the key pillars of Pheu Thai’s populist election campaign was a rice buying scheme that would offer above-market prices per ton of rice to farmers. The scheme quickly collapsed after implementation, with funds exhausted and warehouses overflowing with unsold rice. 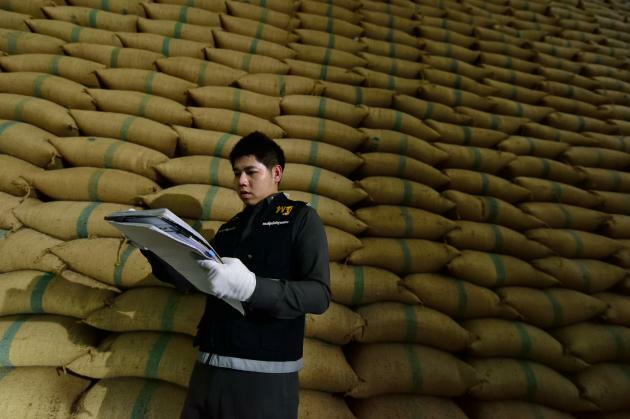 Thailand’s international competitors quickly took advantage of rising prices and diminishing rice quality, absorbing many of Thailand’s longstanding trading partners and further compounding what was beginning to become a national crisis. Government warehouses overflowed with unsold rice amid Yingluck Shinawatra’s ill-conceived populist subsidy scheme. Up to one million rice farmers had their rice taken and were left unpaid for over half a year. The farmers would only receive compensation after the military coup in 2014 that ousted Shinawatra from power. By 2013 and 2014 when protesters began taking to the streets against the Shinawatra government for a variety of reasons, nearly 1 million farmers found themselves unpaid for months. Like farmers elsewhere around the world, many Thai farmers live either at the edge of or deeply in debt, a fact that drove dozens of farmers to suicide as they languished amid the collapsing populist scheme. Cases of corruption and abuse of power began to quickly mount against the Shinawatra government, however the government responded by deploying police and heavily armed militants to force protesters off the streets and openly dismissed the authority of Thailand’s courts. With the courts being ignored and the police under the firm control of the Shinawatra government, the military was forced to intervene, taking power in a swift, uncontested coup. The most recent court case involved Yingluck Shinawatra and several high-ranking Pheu Thai Party members for their role in the rice scheme’s mismanagement which cost Thailand billions in damages and has left its agricultural industry facing a painful process of rebuilding. 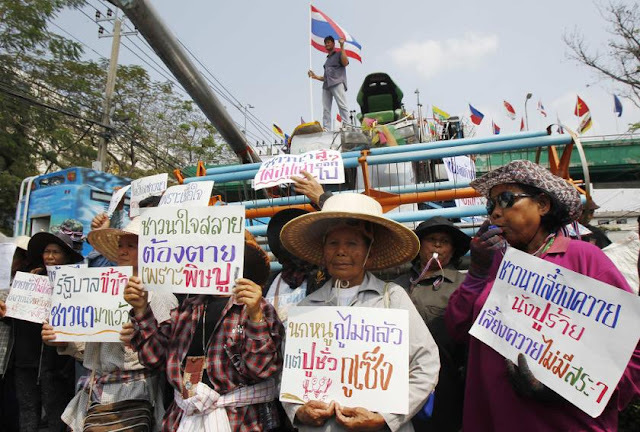 Many former supporters of Yingluck Shinawatra’s government would eventually join protests to oust her in 2013-2014, many of them among the one million rice farmers left unpaid by the government’s collapsing subsidy programme. What is otherwise a clear-cut case of corruption and abuse of power centred around a poorly-conceived populist scheme aimed merely at buying votes, has been portrayed by the US and European media as a “politically motivated” campaign against the Shinawatra family. US and European media attempt to portray the Shinawatras as representative of true democracy in Thailand, chaffing at entrenched “elitist” elements clinging to power in Bangkok. However, even a cursory look at Thailand’s political landscape reveals this to be untrue. The Shinawatras themselves represent in every way in reality the hereditary dictatorship they and their foreign supporters portray Thailand’s current establishment as in fiction. While opponents of Thailand’s traditional institutions allude to its shadowy influence over Thai politics, the Shinawatra family openly ran the government when in power, placing relatives in high-ranking positions and with Thaksin, sister Yingluck, and brother-in-law Somchai Wongsawat each at one point taking turns as prime minister. 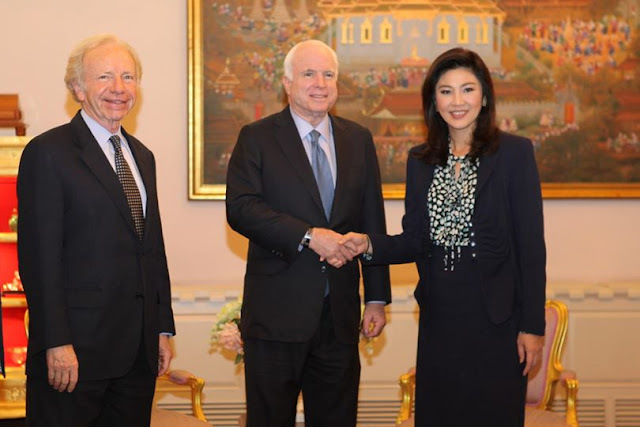 Ousted prime minister Yingluck Shinawatra (right) is seen shaking hands with US Senator John McCain (centre) flanked by US Senator Joe Lieberman (left). The two US politicians are permanent fixtures in America’s regime change industrial complex and often travel abroad to lend US client regimes support in person. In the late 1990’s Thaksin Shinawatra was an adviser to private equity firm, The Carlyle Group. The group included members of former US President George Bush Sr. administration, setting the stage for multiple conflicts of interests in the future. Shinawatra openly boasted upon taking office in 2001 that he intended to use his position in power to continue serving as a “matchmaker” between Thailand and US business interests. Upon taking office, he would begin by privatising Thailand’s national oil conglomerate, PTT, inviting in foreign banks and oil corporations to begin gaining a foothold. In 2003, he would commit Thai troops to the US invasion of Iraq presided over by former US President George Bush Jr. He would also authorise the US Central Intelligence Agency to use Thai territory as part of its global extraordinary rendition programme in which detained suspects were secretly imprisoned, held without charge or legal counsel and tortured. In 2004, Thaksin Shinawatra would attempt to pass without parliamentary approval the US-Thailand Free Trade Agreement championed by many of the corporations still to this day funding and directing efforts to place Shinawatra back into power. It was also under Thaksin Shinawatra that a 20 year peace in Thailand’s deep south with separatists was ended. Shinawatra’s heavy-handed tactics resulted in a 2004 crackdown that saw over 80 protesters killed in a single day. The violence he triggered during his 2001-2006 time in office has continued to present day and has been used multiple times by the United States as a pretext for proposing closer US-Thai “counter-terrorism cooperation.” In essence, it would have been the first of many steps to permanently station US troops across Southeast Asia, a goal openly proposed by US policymakers in papers like the 2000 “Rebuilding America’s Defenses” by the Project for a New American Century chaired by several of Shinawatra’s fellow Carlyle alumni. In reality, from Shinawatra opening up Thailand’s economy and resources to foreign corporations, to offering Thai territory and troops for US wars, to creating a bloody conflict in the deep south to create a pretext for US troops to occupy Thailand itself, Shinawatra was more an agent for foreign interests than a prime minister for Thailand. Shinawatra, his political party and his supporters in the form of US and European-funded fronts posing as nongovernmental organisations, student groups and members of academia, constitute a client regime created by and for foreign interests and represents the same sort of internal interference the United States and its European allies are engaged in around the world from Venezuela and Eastern Europe to North Africa and the Middle East. Shinawatra has enjoyed extensive lobbying services since being ousted from power in 2006 from fellow Carlyle Group alumni and Bush-era adviser James Baker, Barbour Griffith & Rogers (BGR), Amsterdam & Peroff, Kobre & Kim and Edelman. Edelman’s lobbying was headed by Kenneth Adelman who concurrently served as a trustee for the US government and corporate-funded organisation, Freedom House. Freedom House would regularly declare Thailand as “Not Free” in its annual reports for its systematic attempts to remove Shinawatra and his political network’s influence from the nation. Adelman’s role at Freedom House and his paid-for lobbying represent an obvious conflict of interest, further exposing US “democracy promotion” as a facade to obfuscate politically-motivated interference on behalf of powerful special interests. As this facade is increasingly exposed, efforts by other Southeast Asian states to uproot these US networks is underway, including in neighbouring Cambodia. With Yingluck Shinawatra joining her brother Thaksin Shinawatra abroad alongside many other members of the political opposition scattered from Hong Kong to the United Kingdom and even the United States, just as the US has done regarding other “oppositions in exile,” it will continue providing support to them while systematically undermining Thailand until instability provides an opportunity for reinstalling them into power. As was the case in Libya, however, often not much is left to hold power over. It is troubling that despite having the Arab Spring in hindsight, many commentators, analysts and journalists are deferring to ideological superficiality in their analysis of Thailand, and are either inadvertently or intentionally dismissing obvious evidence that once again the United States and its European partners are interfering in the internal political matters of a sovereign nation. Thailand lies at the centre of Southeast Asia and is a pivotal component of Washington’s agenda in encircling, isolating and containing the rise of Beijing. The US since the Korean and Vietnam wars has invested much in entrenching its military in the region. Since withdrawing its forces from the Philippines in the 1990s, the US has sought every means of reintroducing troops in Southeast Asia vis-à-vis China. 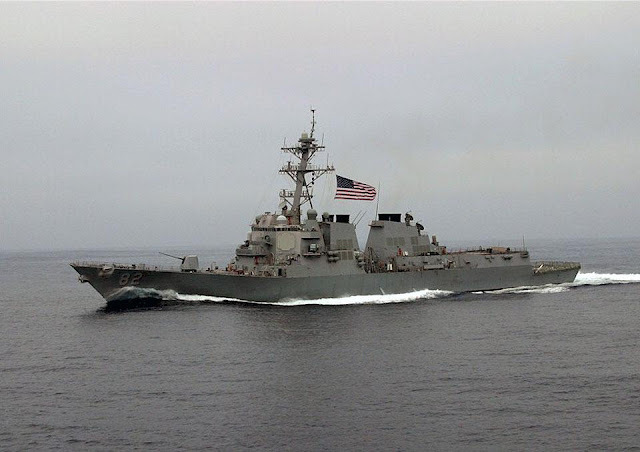 The United States is openly attempting to reassert primacy in Asia through political, economic and military means. Placing client regimes like the Shinawatra government into power along China’s borders is a policy pursued by Washington for decades. In Southeast Asia, American forces are too sparse to adequately address rising security requirements. Since its withdrawal from the Philippines in 1992, the United States has not had a significant permanent military presence in Southeast Asia. This will be a difficult task requiring sensitivity to diverse national sentiments, but it is made all the more compelling by the emergence of new democratic governments in the region. Written in 2000, “new democratic governments” was a reference to up and coming US client regimes like Thaksin Shinawatra‘s government in Thailand, Anwar Ibrahim‘s in Malaysia and Aung San Suu Kyi‘s National League for Democracy in Myanmar. Like Shinawatra, his Malaysian and Myanmar counterparts likewise received immense material support from the US in their respective bids to take and hold power. It should be noted that just as had happened under Shinawatra in 2001 with the resurgence of violence in Thailand’s deep south setting up a possible opportunity for US “counter-terrorism assistance” leading to a permanent US military presence in Southeast Asia as desired by US policymakers, Aung San Suu Kyi upon taking power in Myanmar has similarly presided over a sudden increase in violence involving its Rohingya minority, presenting Washington with an opportunity to intervene. It is particularly worth noting that militant groups involved in Myanmar’s violence are funded and directed from America’s closet and oldest ally in the Middle East, Saudi Arabia, Reuters would reveal. Despite setbacks for the US since 2000, attempts to install client regimes across Southeast Asia or coerce current governments regarding US objectives for the region are still underway, including continuous support provided to the Shinawatras and what remains of their political network in Thailand. Thailand’s current government is deeply invested in building ties with Beijing while maintaining an equitable balance of power in the region between China and its neighbours. The current Thai government has signed multiple infrastructure deals with China including expanding Thailand’s rail infrastructure. It has also begun purchasing weapons from China including armoured infantry carriers, main battle tanks and even submarines. 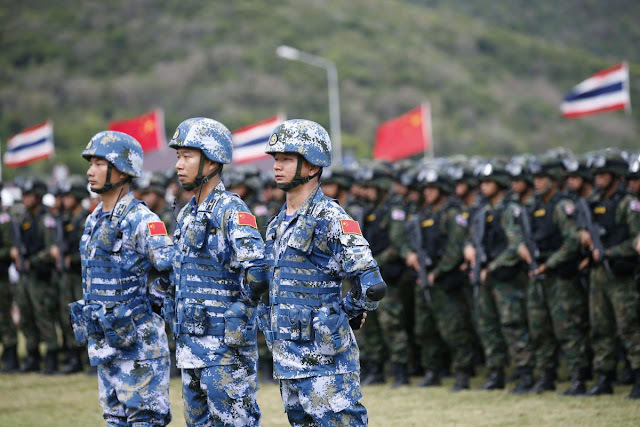 Joint Thai-Chinese military exercises have also commenced for the first time under the current Thai government. Amid its closer ties to Beijing, Thailand’s current government is also diversifying ties with Eurasian powers like Russia as well as Western Europe. It is continuing a centuries-old policy of cautious balance that has kept it the only Southeast Asian state to avoid foreign colonisation. As Thailand’s current government continues writing the US out of any significant future role both in Thailand and in Southeast Asia, attempts by Washington to undermine political and economic stability in Thailand will continue in turn. The only question remaining is how long it will take independent analysts and news organisations to begin fully exposing the political conflict in Thailand in its true geopolitical context, and lay ideologically superficial commentary echoing US and European media talking points to rest. Joseph Thomas is chief editor of Thailand-based geopolitical journal, The New Atlas and contributor to the online magazine “New Eastern Outlook”. All images in this article are from New Eastern Outlook.